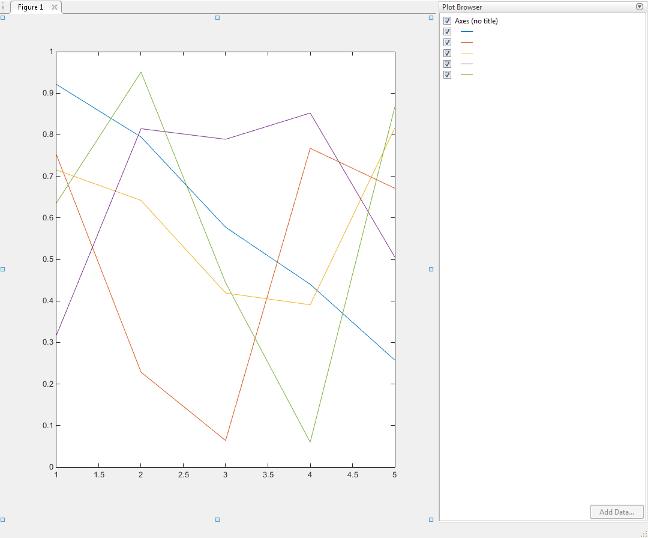 plotbrowser('on') displays the Plot Browser on the current figure. plotbrowser('off') hides the Plot Browser on the current figure. plotbrowser toggles the visibility of the Plot Browser on the current figure. You can use plotbrowser('toggle') instead for the same functionality. plotbrowser(figure_handle,...) shows or hides the Plot Browser on the figure specified by figure_handle. Plot a 5-by-5 matrix of random numbers. Then, open the plot browser. If you call plotbrowser in a MATLAB® program and subsequent lines depend on the Plot Browser being fully initialized, follow it by drawnow to ensure complete initialization. Open or close the Plot Browser tool from the figure's View menu.